My dear friend Frog recently created this satire of Coraline called Cameline. 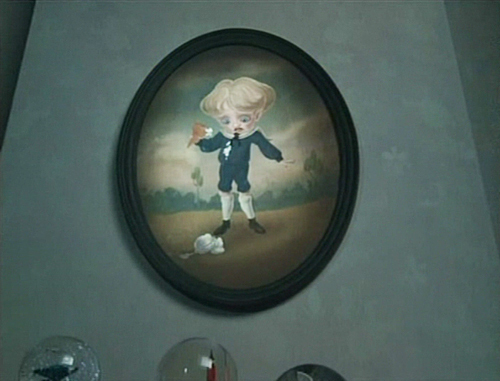 His point is that there are some very odd parallels between Cameron Clark's experiences in House Teal and Coraline's in the Pink Palace apartments. 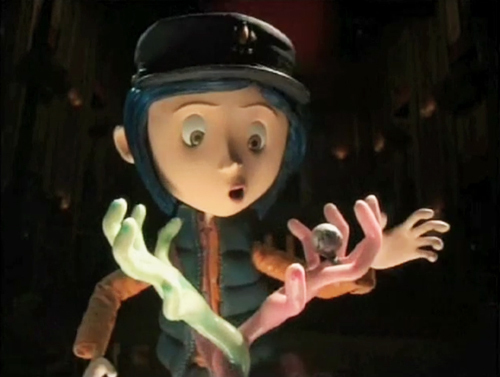 It got me thinking about some of the deeper elements of Coraline, things I'd overlooked when I saw it in the theater. So, I've given the film a fresh look and moved Neil Gaiman's award-winning book up on my reading list, which is to say, I've now read it. It goes pretty well without saying that Gaiman is a genius. 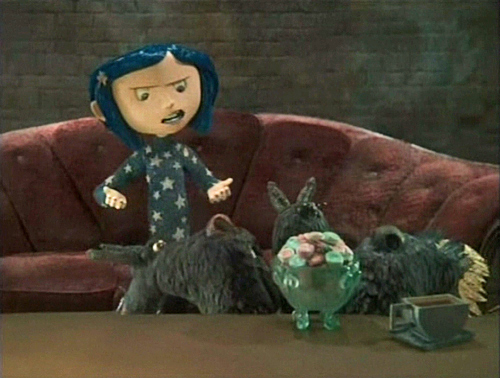 Coraline, the novella, is a masterpiece. Like Alice in Wonderland, to which it is often compared, there's a nod to the shamanic ability of children to traverse worlds through the odd doorway. The story has its own version of the Cheshire cat and even a tea party of sorts. It is also a brilliant depiction of narcissism. The Other Mother lives in her own world, populated by puppets she controls. Those who defy or bore her – who no longer reflect her desires – she throws behind a mirror. She eats up the lives and souls of anyone who crosses her path. Anyone who has ever been taken in by a narcissist for any length of time knows the kind of creeping surreality, the warping of perception, that comes from being caught up in their world view. Henry Selick expanded on Gaiman's book, which wasn't really long enough for a feature film. Characters were added and storylines were extrapolated. What I now realize about the film, is that a mythic subtext was woven through it and that these themes are revealed in striking visuals. 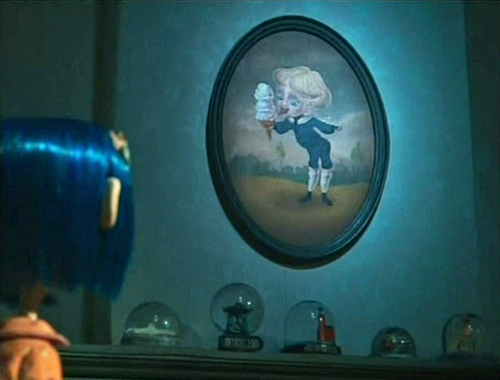 One of the most obvious embellishments in the film is that Coraline's hair is now blue. In the hyper-real color scheme of this stop-motion animated movie, why not blue hair? 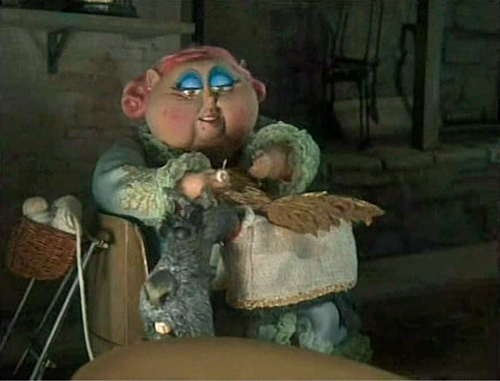 Coraline's upstairs neighbor Bobinsky is entirely blue. But why blue? Why not make hair and skin some other cartoonish color? 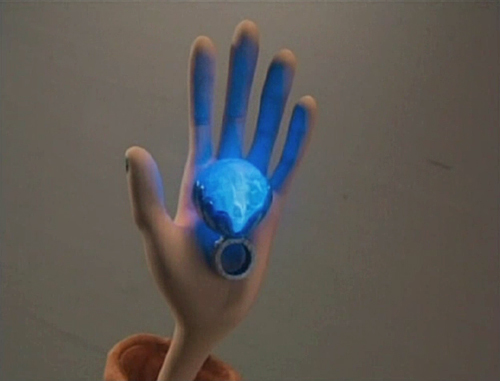 The color blue is a repeated thematic element in the film that I think points to its deeper meaning. 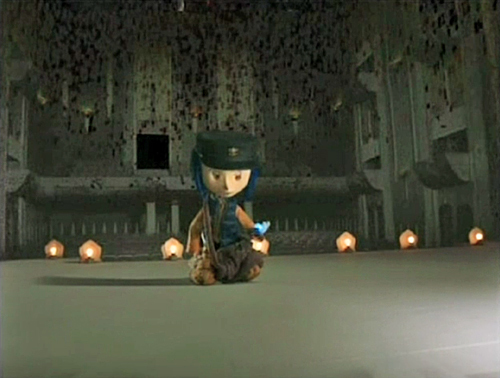 Coraline the movie is really about the soul's journey toward enlightenment. And her eccentric, but prescient, neighbors take on mythic significance in her awakening. 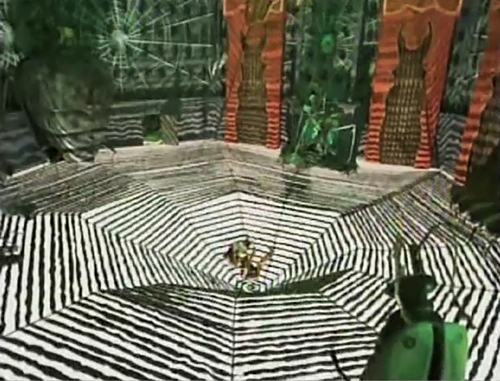 Bobinsky, who fittingly lives in the attic apartment, looks like a Hindu avatar, or many depictions of Shiva, who is also frequently depicted as blue. 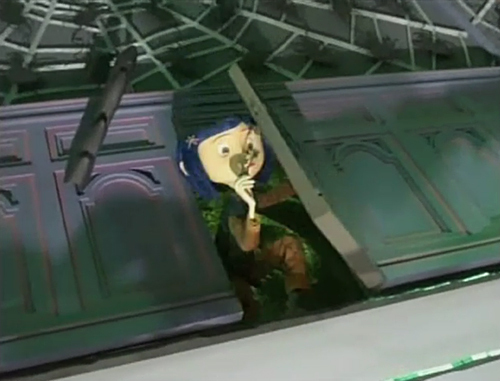 There are few references to blueness in the book, but in one bit of dialogue which is retained in the film, Coraline's father tells her to count all the doors and windows (portals) and list everything that's blue. 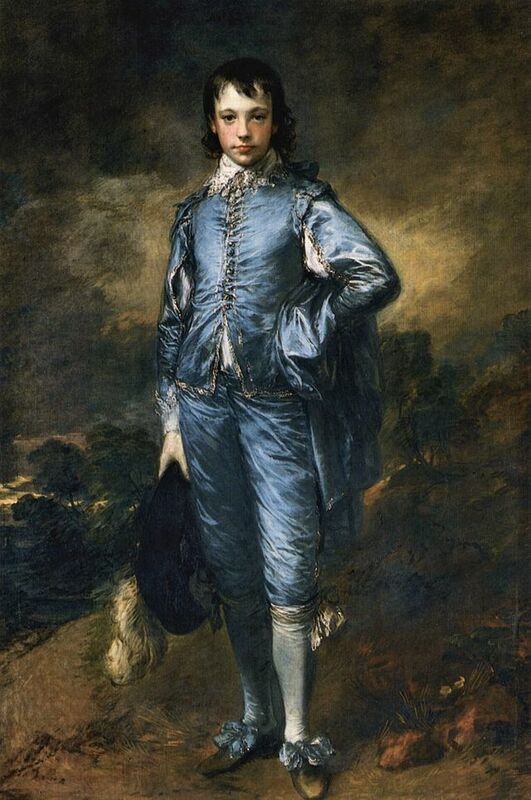 In the film an oil painting of fruit is replaced with a rather creative reenvisioning of Gainsborough's Blue Boy. She describes the painting she finds in her apartment as, "One boring blue boy in a painfully boring painting." Like most things, the blue boy in the Other Mother's apartment, is less boring. Blue is also the color of Miss Spink's rather garish eye shadow. Her roommate Miss Forcible has blue eyes. 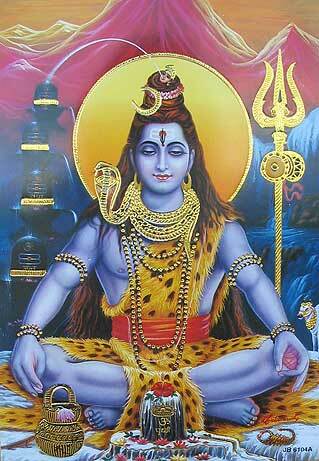 They are the Shakti to Bobinsky's Shiva. They share the basement apartment, the root chakra, while Bobinsky is at the crown. All three of these characters are deeply comical – aging eccentrics likely to be marginalized by those who cleave to normalcy. 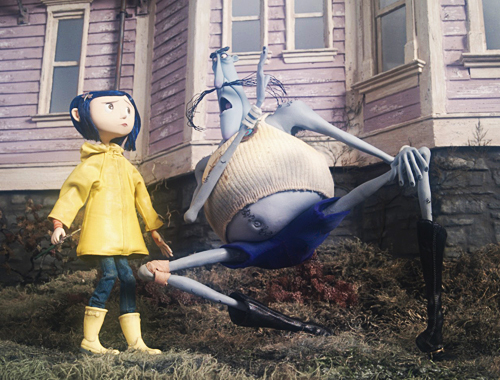 But, Coraline has left normal and they are her guides through the strange changes. Miss Spink is, among other things, a reader of tea leaves. Here she is with her striking blue eyeshadow and a blue fez with a decorative third eye. 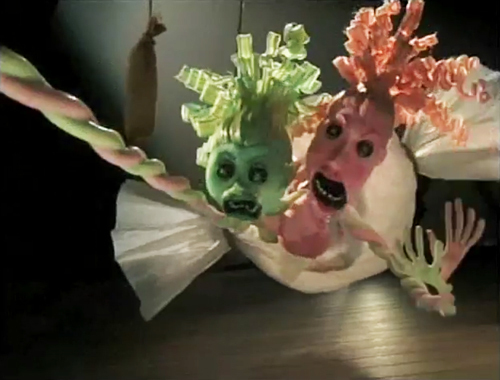 Spink and Forcible put me in mind of the Charles sisters in Pushing Daisies, discussed here. They also engage in the strange funerary rite of taxidermy, having preserved their belated scotties. Like the Charles sisters, they are retired performers. They say theatre, but it's more likely Burlesque. Dare I say it, they worked blue. 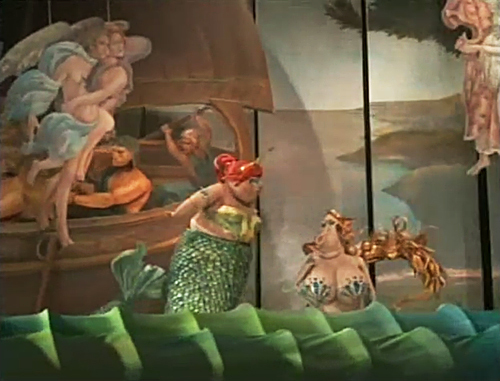 And like the Charles sisters, aka, The Darling Mermaid Darlings, there's an aquatic theme. Miss Spink wears a sea foam green peignoir and a string of pearls. They share a fondness for very old, dry salt water taffy from Brighton, in bowls the color of sea water. In their other forms, they portray the "Sirens of the Sea" in a bawdy performance, no doubt evocative of their actual theatrical history. 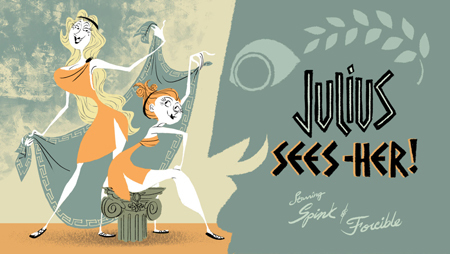 Miss Spink is a "siren of all seven seas" and Miss Forcible, Botticelli's Venus. In their intertwined duality, there are, once again, hints of Starbucks's favorite siren, the "slutty," twin-tailed Melusine. The unpredictability of the powerful woman was explained in alchemical terms by the ambiguous figure of the water witch, Melusine. Melusine was a metaphor for the feminine spirit of nature, the primeval mother of being that led to the production of the philosopher's stone. She stood for the perpetual cycle of generation and regeneration that eventually led to the balance between the four humours. She was a manifestation of the earth mother that devours the dead and brings forth the newborn. From her body, which was like a sealed vessel, the waters of creation rose, and through her agency the sun and moon conjoined in marriage. Half-serpent, she is the naked figure winding her way down the tree of life in the Ripley Scrolls, presiding over the marriage of the sun and moon. Identified with mercury, she was the source of life, the basis of alchemical work, but also a potentially destructive power, at once medicine and poison. Though a loving wife and mother, a builder of castles and founder of a dynasty, Melusine remained in her hybridity, mercurial and unfixable. Of the two, Miss Spink is the more dialed in. Her abilities extend far beyond reading the tea leaves and sensing danger. 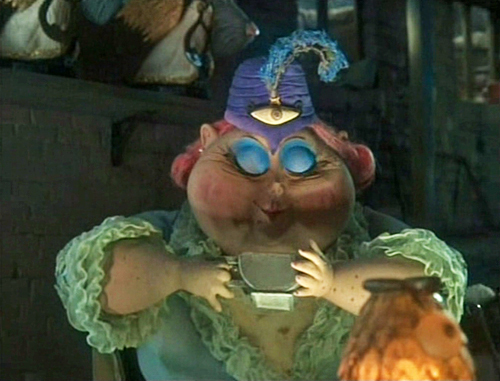 After Coraline discovers that the Other Mother has trapped the souls of other children and hidden her real parents, it is Miss Spink who gives her her most important tool. But, first she must tear apart some old salt water taffy with her knitting needles. From the bottom of this tiny, metaphorical ocean, she withdraws a very important stone. The philosopher's stone? Perhaps. Cue the Masonic, Illuminati paranoia. Her dogs are all scotties – Scottish Rite Masonry (???) – and she's produced an eye in a triangle. But, in keeping with the true meaning of that symbol, it's purpose is the awakening of the soul and the ability to see beyond the illusory world. Miss Spink is an alchemical adept. 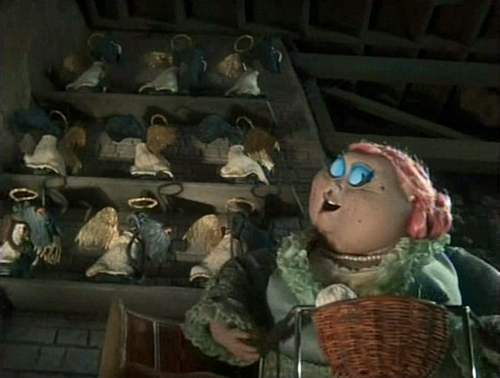 She has twelve scotties – three living and nine preserved like mummies – like the twelve gates envisioned by alchemist George Ripley. She is an architect of ascension and she has handed Coraline the tool by which she might free the dead from a kind of purgatory. 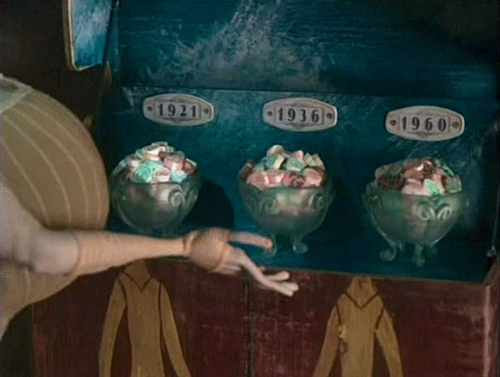 Through the stone, Coraline can see the souls of the three children in their hiding places and one of the three is held by the other version of Spink and Forcible, whom she finds reduced to the salt water taffy they treasure. But, it is here that she finds the most richly symbolic of all the hidden objects, because it is not just the soul of one of the children. It's the blue pearl. 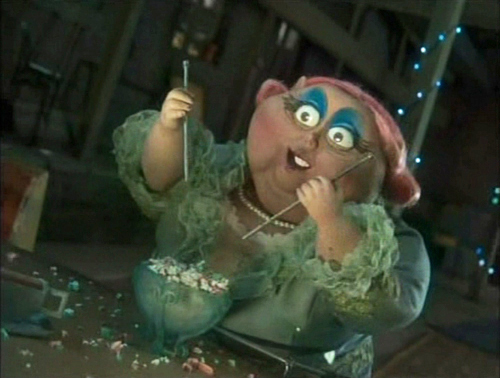 She pulls the taffy monster's oyster shell hands apart and exclaims, "the pearl." "Beware of old oysters too large in the chest..."
The blue pearl is something I touched upon here. It is elusive and subject to a number of interpretations, but the experience of it, when it occurs, is fairly tangible. As per Muktananda, it is a direct interface with the soul. 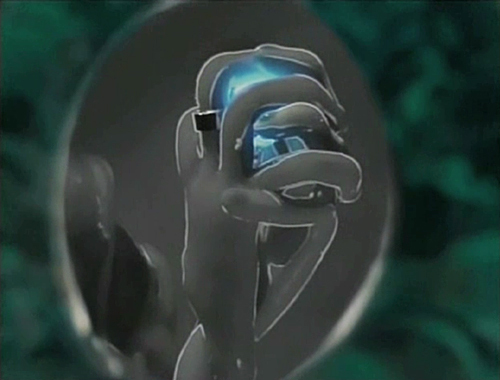 Having recovered the pearl, Coraline watches as the illusory world disappears before her eyes, leaving her with nothing but the true, blue soul. But, she has tricked the Other Mother into giving up the key to the kingdom. "And I will give unto thee the keys of the kingdom of heaven: and whatsoever thou shalt bind on earth shall be bound in heaven: and whatsoever thou shalt loose on earth shall be loosed in heaven." Coraline instinctively knows that to free the souls of the three children, she must put them under her pillow and sleep. It seems like something of a leap, but it points to the correlation between the shamanic journey and the dream state. The sky opens to her like the ecstatic vision of Vincent Van Gogh, a painter who demonstrated a rather remarkable insight into the very fabric of the world. 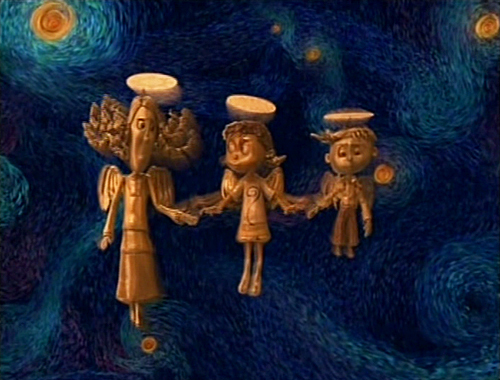 The ghost children have transformed into angels of alchemical gold. It is a fairly obvious nod to Jacob's dream of the ladder, which unfolds when he sleeps on a stone pillow. 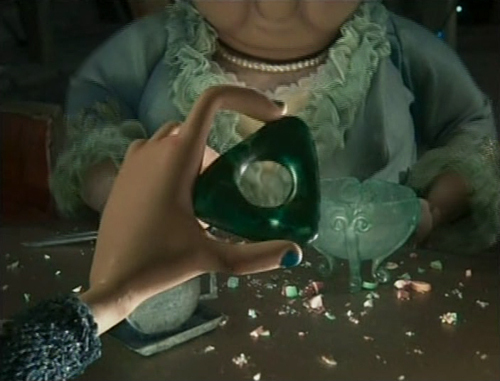 Having freed the souls of the dead, Coraline's only remaining task is to consign the key to the bottom of the well, which she does. "And I saw an angel come down from heaven, having the key of the bottomless pit and a great chain in his hand. And he laid hold on the dragon, that old serpent, which is the Devil, and Satan, and bound him a thousand years, and cast him into the bottomless pit, and shut him up, and set a seal upon him, that he should deceive the nations no more, till the thousand years should be fulfilled: and after that he must be loosed a little season." 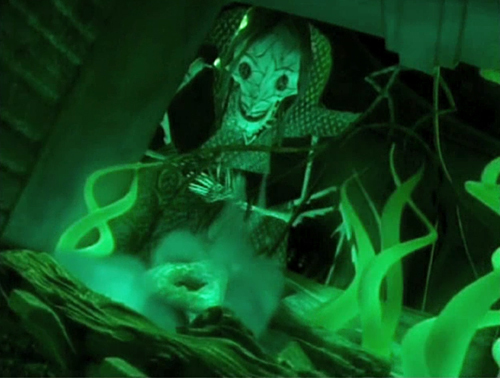 And never fear that Coraline's process of ascension was subverted by the beldam. She may have thrown her third eye piece into the fire, but the fire serpent is the great awakener. 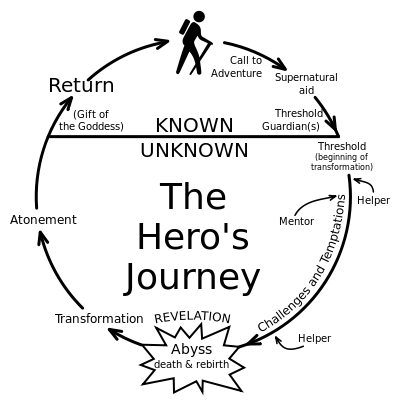 Note the coiling DNA-like flames. 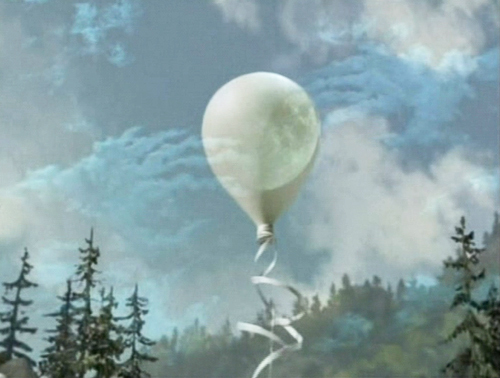 Here they are again as the pretty balloon frees itself from the clutches of Maya and ascends. Coraline's ultimate victory and level of attainment completes her hero's journey and her story hews at least very closely to Joseph Campbell's monomyth, simplified here in this chart. She triumphs despite temptations and missteps, with supernatural assistance and direct help from the Mother Goddess. She achieves an internal transformation and brings back a "boon" for her community. As is so often the case, Coraline's path to awakening begins with a sense of restlessness and frustration. Like The Fool in the tarot, she embarks on a journey of exploration. Empowered by her own audacious sense of adventure and rebellion, she ignores a number of signals and warnings, completely oblivious to her own vulnerability and to just how much evil exists in the world. "A beginning is a very delicate time," says Princess Irulan in David Lynch's envisioning Frank Herbert's Dune. And so begins Paul Atreides's quest to master production of the brilliant blue spice produced by the serpentine denizens of the desert planet Arakis. It is a delicate time, indeed. This transformation from caterpillar to butterfly, nymph to dragonfly, lead to gold, is time of vulnerability and peril. The matrix does not release us easily. 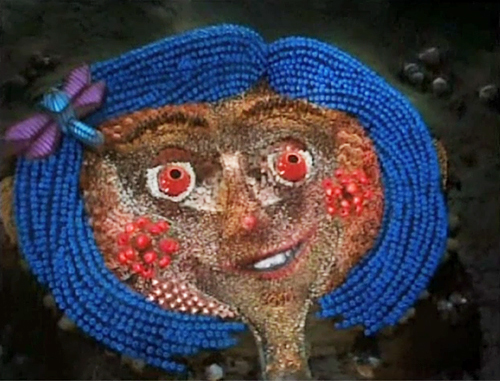 But, Coraline's path of destiny is clearly indicated by her blue hair, her dragonfly hair clip, and by the noticeable illumination of her third eye in her floral portrait. Like the butterfly, the dragonfly symbolizes transformation and immortality. In thematic harmony with the other aquatic elements in the film, the dragonfly lives out most of its life underwater. When it reaches maturity, it casts off its husk and flies toward the sun on beautiful, new wings. Like the pearl, the dragonfly is iridescent, suggesting the rainbow body. The symbolism of the dragonfly was also put to good use in the London Olympics tribute to alchemy opening ceremony. As is also too often the case with spiritual seekers, Coraline wanders into a cul de sac and is nearly stuck there for the duration. Through a combination of courage, native ability, and supernatural guidance, she is able to extricate, not only herself from this trap, but others who saw the danger too late. There is no path to mastery that does involve conflict, peril, and usually some form of betrayal. 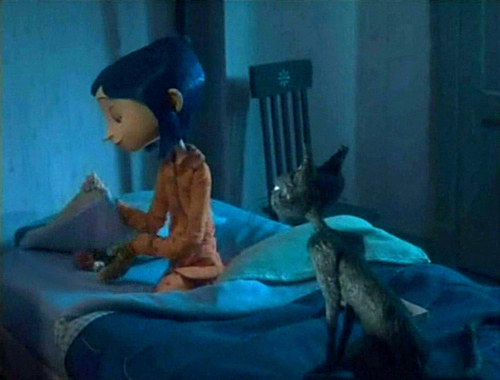 In order for Coraline to be drawn into the Other Mother's world, she has to ignore a number of red flags, starting with the too good to be true nature of it. Whenever Coraline's qualms might arise, there is some delightful distraction. The Other Mother seems a little too fond of games and anxiously drums her fingers on the table at the thought of them. She plays to win, even if it means cheating. The most obvious indicator of trouble is the eyes of everyone in the Other Mother's world. Eyes are the windows of the soul, so the lack of real eyes indicates soullessness. I don't like so and so's eyes is a good reason to walk very quickly in the opposite direction. But, we only learn how to avoid such traps and snares from having at least once escaped them... if we survive to tell the tale. Man... You definately are Teal's #1 hater. Thank-you! It was a tough competition against a strong and growing field of seasoned haters. But, I trained hard and, in the end, the training paid off. This article is hardly all about teal. It's great, I thoroughly enjoyed it. Thanks, LaVaughn.